This cannot be happening……. Please tell me that I’m dreaming that Donna Summer has died????!!! Please no…. Close to tears listening to “I Feel Love”. What a woman, most sexual vocal ever recorded. Police were called by London Ambulance Service to an address in Camden Square NW1 shortly before 16.05hrs today, Saturday 23 July, following reports of a woman found deceased. On arrival officers found the body of a 27-year-old female who was pronounced dead at the scene. Inquiries continue into the circumstances of the death. At this early stage it is being treated as unexplained. Amelle Berrabah of Sugababes (@Amelle_berrabah): Is it true about Amy Winehouse? The Sirens (@OfficialSirens): Amy Winehouse found dead. Absolutely tragic. Is this true???? RIP Amy Winehouse – what an incredible talent – how utterly tragic. So sad. Kay Buchanan (@keisha_buchanan): Amy Winehouse ;-( heart breaking…. Ferras Al Qaisi (@OhFerras): Shocked and filled with sadness. RIP Amy Winhouse. Jessica Origliasso of The Veronicas (@Jessicaveronica): Horrible news about Amy Winehouse’s death. May she rest in peace. Such a talented lost soul. Lance Bass of *NSYNC (@LanceBass): Another talent dies at 27- RIP – Amy Winehouse. Christina Perri (@christinaperri): oh Amy. rest in peace now darling. La Roux’s self-titled Cherrytree Records debut won the Grammy for Best Electronic/Dance Album on Sunday night in Los Angeles. The category included former Grammy winners The Chemical Brothers, innovative electronic musician BT and fellow Brits Groove Armada and Goldfrapp. 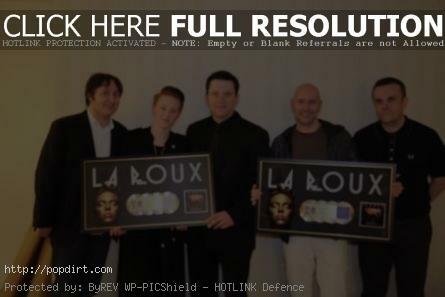 On Friday night in LA before the Grammy ceremonies, Cherrytree Records presented La Roux’s Elly Jackson and Ben Langmaid with plaques commemorating 2 million singles sold of their smash hit ‘Bulletproof’. Along with the release of remix album ‘Gold Edition’ and two new live performance videos, Tuesday also saw the premiere of La Roux’s third tour webisode on Teen Vogue. In this clip, Elly Jackson and the band signed autographs for fans and revealed what it’s actually like to be a band on the road – lots of waiting around in dressing rooms. Watch it below. La Roux’s ‘Gold Edition’ is now available digitally via iTunes and Amazon MP3. Fans can also order an exclusive physical copy of the album through Amazon’s Disc on Demand feature, which creates a custom CD-R disc with album artwork specifically for each order. Also premiering today are videos for acoustic versions of ‘Bulletproof’ and ‘In For the Kill’, taped during an intimate recording session at the famed Abbey Road studios. The ‘Bulletproof’ acoustic track is one of the many highlights on ‘Gold Edition’, which features acoustic, demo, and remix versions of popular tracks from La Roux’s Grammy-nominated self-titled debut, in addition to b-sides and other exclusive content. Fans who didn’t get a chance to see La Roux in concert during this past fall’s Gold Tour can get a taste of the on-stage action in frontwoman Elly Jackson’s latest webisode for Teen Vogue, which takes the ‘Bulletproof’ singer to Atlanta, Philadelphia, and a sold-out show at Boston’s House of Blues. Watch it below. La Roux recently wrapped an eleven-date US tour, and frontwoman Elly Jackson has given the exclusive behind-the-scenes scoop to Teen Vogue. Episode one of the video series takes the band across New England, with a day off in Washington, D.C. and a glimpse into rehearsals for their upcoming New York City shows. Watch the highlights below. 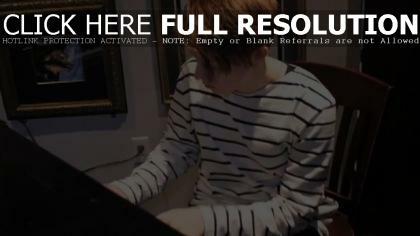 Cherrytree TV has footage of La Roux’s visit to America on tour. Singer Elly Jackson is seen talking with Perez Hilton, doing some piano rehearsals, skipping rope, and wraps up with a walk on stage. Watch the clip via YouTube below. 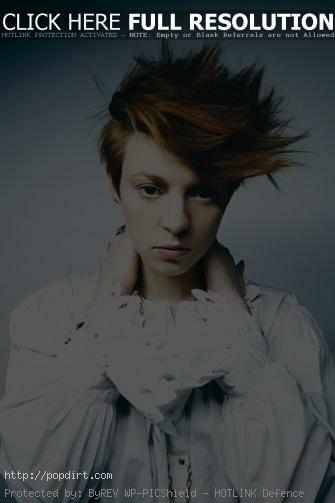 A brand new version of La Roux’s ‘In For The Kill’ featuring Kanye West has been posted at the duo’s MySpace. Kanye teamed up with Elly Jackson in New York City last month to put his own spin on the track with an original verse. Listen to the song below.